Mister from Pensyl-hio asks, "Hey, old man, summer's here and the close star is emitting that telltale twinkle, what have the Dukes County Sight Casters been getting into?" Well Mister, we've been pushing the big rig around a variety of submerged terra firma, including but not limited to light, dark and patch bottom, finding good numbers of grabby brown clown and double diamond difficult wrasse. Pictured in this spread are Christopher from Falmouth, David from behind the airport, Scott from Trout Unlimited, Michael from the nutmeg state, the author, the brown clown and the coveted fly caught, sight cast, tog wrasse, a potential world record none the less. Congratulations Christopher. I'm very pleased with the current fishing trend on Cayo Martha, hopefully it holds up for us. Last week I had the opportunity to fish with some interesting folks, Rob and crew who own and operate a website on the island called What's Up Martha. If you know me, you know that I truly believe hyper-local web based content to be the future of media. These guys are riding that wave and riding it well. They also did a nice little write up about their day out fishing with the old man, which you can view here. Thanks for that guys. "Compass card is spinning, Helm is swinging to and fro"
When the Surfmaster from Dark Woods woke up on Sunday he thought he'd go out for a friendly aboard F/V Gut Feeling with the guy from Coops and Al and Maggie from Chase. Heck, he thought he might even get a nice doormat. Don't think he bargained for the whole rug. A tourista from the great white north commented that he didn't know we had halibut here. Neither did I. Congratulations to Captain and crew on a truly magnificent achievement. The striped fish have been hitting the deck as well. It's like, what can't this guy do? Aboard the Blue Wail the fishing has been sometimes fast, sometimes slow, always colorful of course. Pictured above are Nicole from the aloha state, the author and the brown clown. When she's not teaching classes or kayak guiding in Volcano National, Nicole can be found floating around Cayo Martha, shredding on topwater. Pretty work Nicole. A note to the striped fish. Beware. If your not careful when swimming by the kids you may wind up panko encrusted over a bed of udon, in a shitake miso broth. Good for us, for you not so much. "Never could read no road map, No I don't know what the weather might do"
Standing the precipice of the Solstice, it seemed like one last photo tessellation from the vernal season would be opportune. Incredibly fun weekend as always with the StriperFest crew. Fly fishing on the enclave in the ocean has been relatively robust as of late, with the brown clown falling victim to various methodologies. These include, but are not limited to, sight casting and open water fishing. "Wishin' every month of the year could be June"
Bill from Jackson drew a tough day. 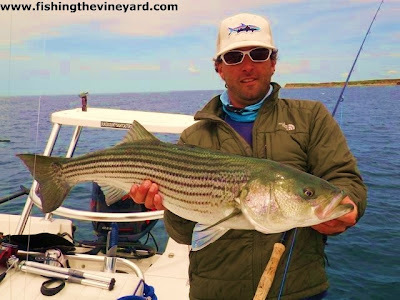 An old adage dictates that when the wind is from the north, wise anglers don't go forth. That's all well and good, but striped fish season is only a few months long, so generally Fishing the Vineyard kids go anyway. Plus sometimes we hammer on a north. This day not so much, but we did prove that persistence pays. "Thanks for being there partner." Phil from Toronto proved to be an interesting case study. I fish a lot of strong anglers, and Phil stands amongst any of them. His skill set translates nicely to the potato farm and the skinny patch bottom, which is convenient for him, less so for the brown clown. Pretty work Phil. And sometimes the sun-dog comes. And then the kids begin to whisper. Pictured in this montage are the author and the Jimmy Crab. What can you even say about Jimmy. Look at the lips. Look at the slime. Truly you are the Obi Wan to our Skywalker. I honestly can't believe how the spring has flown by. The summer is almost upon us and fishing on planet mothership remains strong. The open water bite has been relatively accordant. Some days are easy and the rail if rife with the brown clown. Others are more difficult and we grind for exiguous digits. The clouds and rain have kept the Dukes County Sight Casters in the barn for the most part, but fear not, there's plenty of time left for all that. Pictured in this spread are BD from Gotham, Dave from the Garden State, Matt from the city of brotherly love and the author. These guys are strong anglers with whom I've worked often...they get it done and it's always a pleasure to share the skiff with them. Pretty work guys. Nothing ever goes as planned"
Recent outings of the Dukes County Sight Casters have been met with positive results. Pictured in this spread are Harry and Lou from the Granite State and the striped fish from the light bottom. Thought I wouldn't drop a little black and white in the mix; foolish really. Lately it seems like when the viz is there so are the fish. So I got that goin' for me, which is nice. Sometimes when the stars line up or whatever we go out under the aviary for a frolic in the potato patch. Open water fishing can be most productive at this hour of the season, and in order to stay true to the ethos of program diversity from time to time a trip out off the flat is necessary. Pictured in this spread are Andy from Palo Alto, Bill from Jackson and the author. 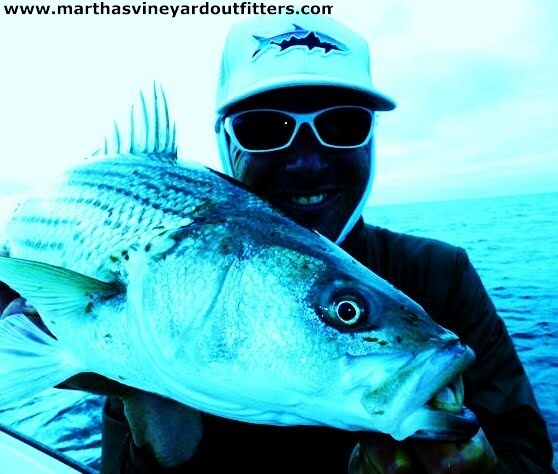 Kevin from Plover quips, "powder blue skiff, white shades and a 7 weight from Oregon, it's all a little much no?" Um...maybe so maybe not?